The third-seeded LSU Tigers will take on the No. 14 Yale Bulldogs at 12:40 p.m. ET Thursday in a first-round East Region matchup in Jacksonville, Florida. The Tigers, who are playing under interim head coach Tony Benford while Will Wade is suspended pending an investigation into alleged recruiting violations, won the SEC regular-season title but were upset by eighth-seeded Florida in their first game of the SEC tournament. LSU is led by sophomore guard Tremont Waters, who is averaging 15.1 points on the season. No. 14 seed and Ivy League champion Yale is led by junior guard Miye Oni, who is averaging 17.6 points on the season. LSU last played in the NCAA Tournament in 2015, when they lost in the first round to North Carolina State. Meanwhile, Yale is making their second tournament appearance in the last four years and their fifth appearance overall. The Bulldogs have only won one tournament game in their history, beating Baylor 79-75 in 2016. 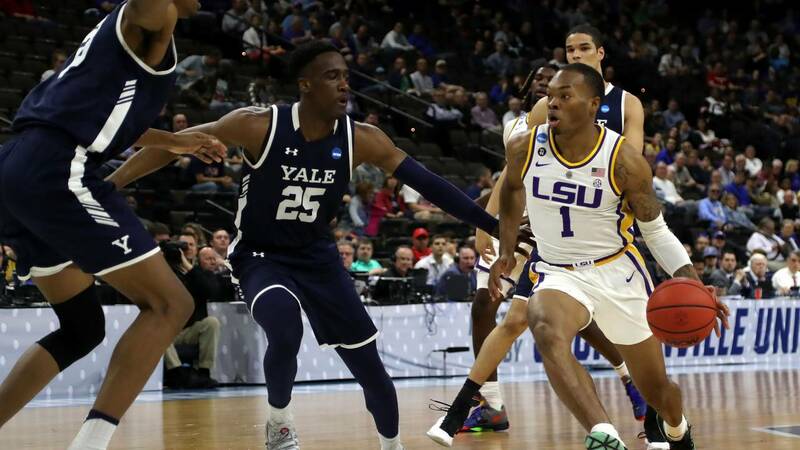 The LSU-Yale winner will face either No. 6 Maryland or the winner of Tuesday's First Four game between No. 11 seeds Belmont and Temple in the second round on Saturday.